If you’re looking for something a little bit cheaper than a platinum rated 1600w Corsair power supply unit, then you should check out these server PSUs. With a breakout board and some GPU power cables, you can have 1200 watts (at 240 volts) or 800 W (at 120 volts) of Platinum rated power for under $60! Total Approx Cost $470 for Platinum, $360 for Gold $60 + $30 + $40 + $120 = $250 for 1950w of Platinum Power! 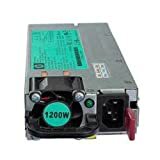 This is also a good choice for a mining power supply unit, but you may choose to buy something with a higher rating. This is a power supply meant for servers, but works well as a mining PSU if you also get the necessary cables and breakout board to get the power to your mining GPUs. Keep in mind, this power supply is only ‘silver’ rated which means the power won’t be as clean, and some even claim that it will produce more stale mining shares. I don’t really believe that’s the case, but if you plan on overclocking and undervolting and all of those other goodies, you definitely don’t want micro-volt spikes coming down the lines to your PSU. And, for only a few dollars more you can get the platinum rated power supply for mining. This HP server power supply unit is a great option for a mining power supply. It’s 1200 watts of power on a 240volt plug, or up to 800 watts on a 120 volt/standard household plug. Plus, being platinum rated, you can be sure that it will provide clean, high quality stable power to your expensive mining gpus! It’s one of the best options for a cheap mining rig power supply. Just like all the other server power supplys listed, you’ll need a plan to get the power to your GPUs. Likely, a high quality breakout board will do the trick, and then the last thing you’ll need is a low power standard computer PSU to power your mining motherboard and hard drive. Remember you’ll need some other items in order to get the power from your cheap power supply unit to your mining rig GPUs. 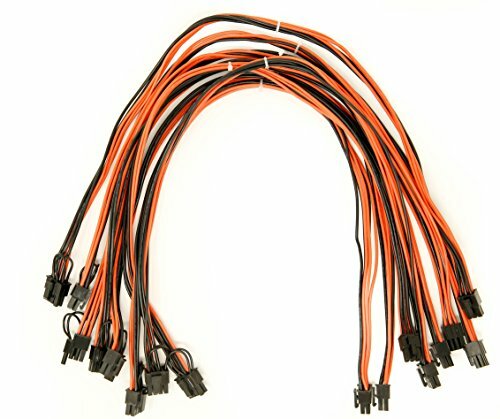 These 6+2 pin PCI power cables will get the power from your server PSU (with breakout board attached) over to your GPUs. Most mining rigs will have the power supply close enough to the mining gpu that the 24 inch length on these is more than enough. Check PriceThis is the interface that plugs into your server PSU and gives you standard 6-pin molex sockets to plug your cables into. The only other option would be to solder and hardwire some cables onto the power supply to allow you to plug into your GPUs, but this just seems way easier! This is a 12 plug board, or for a few dollars cheaper you can get an 8 socket breakout board if you don't need to power as many mining GPUs. Keep in mind that some breakout boards don't have power switches while others do. This mining breakout board has a power switch below the digital readout, and it also has the ability to connect to your main ATX power supply so that both switch on at the same time. Some of the cheaper boards will just have an 'always on' feature by simply connecting the 1st and 4th pins together on the breakout board which will turn on the PSU as soon as you plug it in. This 750 Watt powers upply by EVGA is rated at 80+ Platinum efficiency. It's a great choice for a middle range amount of power. It won't be enough to power a GPU mining rig with more than a few GPUs on its own, but when used in conjunction with some of the server-made cheap power supply for mining, it works to power the motherboard and hard drive as well as the PCI slots. Then, with PCI power cables you can send more power directly to your GPUs from the server PSU breakout board. 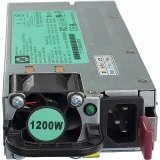 Yes, it's a bit more complex, yes there are 2 power supplies to power on and manage, but overall this setup can save you over $200 when compared with buying a high power, platinum rated power supply built for a desktop computer. And for those who love videos, here’s a YouTube video I found talking about the best power supply for mining rigs and it shows a breakout board connections and the server PSUs listed above.